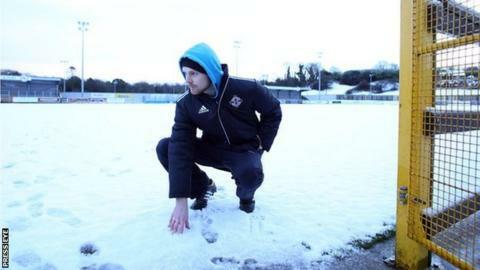 Two of Saturday's Irish Premiership matches have been called off because the adverse weather conditions have made the pitches unplayable. The games between Ballinmallard United and Linfield at Ferney Park and Coleraine against Glenavon at Ballycastle Road have been postponed. Both grounds failed pitch inspections on Saturday morning and have been rescheduled for Tuesday 27 January. Institute will play Dungannon Swifts on the same night at Drumahoe. All three fixtures will kick off at 20:00 GMT. Institute's home game against Dungannon Swifts on Friday night also fell victim of the weather, as has the Championship One fixture between Loughgall and Ards in Championship One. Five Championship Two games have also been postponed, Ballymoney United v Coagh United, Banbridge Town v Glebe Rangers, Tobermore United v Sport and Leisure Swifts, Wakehurst v Portstewart and Dollingstown v Lurgan Celtic. Limavady United v Queen's University and Newington v Moyola Park are the only games to survive the cold snap in that division.